There’s nothing nicer on a cold day than a soothing cup of herbal tea. But besides being a tasty, warming, caffeine-free pick-me-up, herbal tea has lots of wonderful health benefits. From soothing a troubled tummy to easing insomnia and calming a troubled mind, herbs have all sorts of healing powers. Drinking herbal tea can also be a great source of vitamins and minerals. Herbal tea isn’t really made from tea instead it is really just an infusion of leaves, seeds, roots or bark, extracted in hot water. In drinking a well-steeped herbal tea, we get all the plant’s benefits in an easily digestible form. When it comes to choosing a herbal tea it’s important to look for a well-sourced product made from high-quality ingredients. If you’re drinking tea for the medicinal benefits, then definitely steer clear of products that add things like essential oils or flavours. 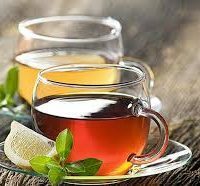 And to really get the full benefits from drinking herbal tea, make sure you steep your loose tea or tea bags long enough’in some cases, as long as 10 to 15 minutes’to really bring out all the healthful properties. Drink peppermint tea to relieve the symptoms of abdominal gas and bloating, and to relieve muscle spasms. It’s also good for nausea (without vomiting) and for heating up body and making it sweat. If indigestion or heartburn are problems, however, then avoid peppermint altogether. Peppermint tea can also be made using fresh herbs from the garden-and it’s one of the easiest herbs to grow. Another great digestive aid, ginger can be used to curb nausea, vomiting or upset stomach due to motion sickness. Make fresh ginger tea by simmering a piece of ginger root on the stove for 10 to 15 minutes-add fresh lemon juice and honey when you have a cold for a powerful germ-fighting combination. making tea from powdered ginger to ward off a chill. A gentle calming and sedative tea made from flowers, chamomile tea can be helpful for insomnia. It can also be helpful with digestion after a meal. One can also drink chamomile in cases of a cough and bronchitis, when you have a cold or fever, or as a gargle for inflammation of the mouth. Be sure to steep it well to get all the medicinal benefits. High in vitamin C as well as other minerals, rooibos has all sorts of health benefits. An easy drinking tea, it’s largely grown here in South Africa and has been touted for its antioxidant properties-which may in turn help ward off disease and the signs of aging. It has also been shown to help with common skin concerns, such as eczema. An easy-to-grow plant, lemon balm is helpful for lifting the spirits. ‘It’s good for the winter blahs,’ and it can help improve concentration.’ Lemon balm is safe for children and may help prevent nightmares when consumed before bed. This herb also makes a refreshing iced tea, and can be flavoured with lemon or maple syrup.